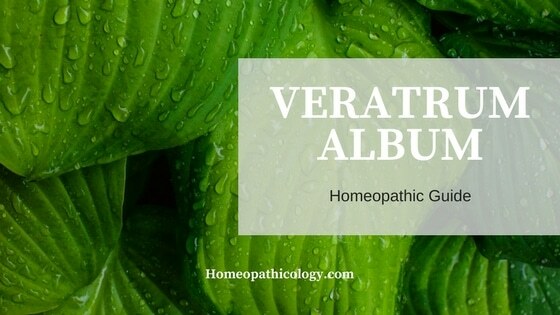 Veratrum Album is the homeopathic remedy. It is also known as White Hellebore. 3 Similar Homeopathic remedies as Verat. Alb. Veratrum produces such a sudden and profound prostration as to closely resemble the collapse which often occurs in cholera and cholera morbus. The heart action is very feeble, the skin becomes cold and bathed in cold perspiration, especially on forehead and face. Vomiting and purging with colic and at times cramps in muscles. Veratrum has established its curative virtues in many epidemics of cholera, cholera infantum, and cholera morbus. To be thought of in ptomaine poisoning, malignant whooping cough, painful cramps, dysmenorrhea with diarrhea. See guiding symptoms for specific indications. Do you want to know that what is homoepahtic and How does Homeopathy work? Excitement, raging and delirium with a desire to escape. Melancholia with sullen indifference. Pain seems to drive to madness, (Cham.) with cold sweat on forehead. In some forms of acute insanity, and puerperal mania, Verat. has proven a valuable remedy. Some vertigo and pressure about the brain, with the sensation of ice on the vertex. Pale, sunken, anxious, (Ars.) bluish cold, with cold sweat, especially on the forehead. The pinched features and cold sweat are often present in sudden attacks of vomiting and purging. (See Ars., Camphor and Carbo veg.) The face symptoms of Veratrum album presents a fair picture of cholera in its various forms. Tongue pale and cold in collapse. Dryness of mouth, craving for water. (See Aeon., Ars.) Occasionally great hunger and thirst, craving juicy things. Vomiting of food and water soon after swallowing the same, with continued nausea and gagging, (Ars.) profuse, watery mucus and blood with distention of the abdomen, cold sweat and utter exhaustion. Nausea and vomiting increased by motion or by drinking. Severe, sharp, cutting, colic pain in the abdomen (colocynthis) with distention and tenderness. Griping and cutting pain soon after eating with coldness in the abdomen. Stool often thin like rice- water, as in cholera, always profuse and frequent, with exhaustion and cold sweat. Stool painful with cramps, worse after eating fruit and drinking cold water, and at night. Exhaustion and involuntary stool. Great exhaustion to faintness after stool, which is generally copious. Severe cramps and copious, watery stool before or during menses. Maybe vomit ing and cold perspiration. Some severe forms of whooping-cough accompanied by vomiting and diarrhea, with the sense of exhaustion after such paroxysm with choking and blue face, cold sweat on forehead, constriction about the larynx with suffocated feeling before and after a cough. The coldness of the skin with cold perspiration. The face is cold and distorted. Chilliness in the back. Hands and feet cold. Heat follows or alternates with chilliness with much thirst through both. The chills and fever of Veratrum Album are usually such as precede or accompany violent attacks of stomach and bowel trouble and, while they are to be regarded in selecting the remedy, they are of minor importance compared to the few characteristics or keynote symptoms which run all through the provings of this remedy. The unmistakable exhaustion and collapse, the cold perspiration, the vomiting, purging, are safer and more reliable indications for the use of Veratrum. The action of veratrum alb is always prompt. When well indicated a single dose will often so change the condition for the better than a repetition of the dose becomes unnecessary. Similar Homeopathic remedies as Verat. Alb. Aggravation or irritation from motion, drinking or eating (vomiting). After fruit and indigestible food (cholera morbus). The patient feels better by walking about and from warmth. Do you have any other symptoms? Check complete homeopathic remedies list with disease.